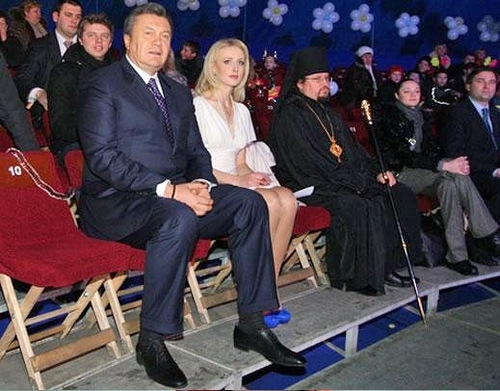 This woman is Lubov Polezhai, ex common law wife of the ex-president of Ukraine – Victor Yanukovich. They have been dating for many years though the dictator was not divorced with his wife Ludmila. They say she’s a sister of the president’s cook. And this one is Alena Berezovskaya. It was her who was leaving Mezhigorie (the settlement where the house of the president was located) by helicopter together with her belongings and her dog. Her departure was shot by surveillance cameras and those records came into the hands of journalists. How did an elected president become a “dictator” in your book? Because he was forced out by a minority of US orchestrated Nazi thugs, soccer hooligans and bandits? Because CNN and FOX told you so? 100% Agreed. The only thing I can add is that he has funds in offshore banks, so I guess he was on the hook by CIA already. She can stay, as Beauty is sorely needed in her country.